Vladimir looked at St. Petersburg receding in the ship's wake only once. Walking to the front of the boat, the six foot Russian looked forward across the ocean, wondering what America and the Wild West would bring him. Sandy King already knew what the Wild West was like. He'd been operating in it for years, surviving by using two rules. First, get lost when an argument looks like it might turn violent. Second, don't steal anybody's horse. And he had one more rule-always accept a free drink. As he sipped a glass of water, Vladimir looked through the hotel window at the grimy sootiness of New York on a warm humid day. He set the glass down, walked over to the bed where he began opening several large boxes. Soon he stood in front of the mirror and surveyed the rugged looking cowboy in chaps, vest, cowboy boots, ten gallon hat, and ivory handled colts. He named the cowboy Bill. Bill slipped one of the guns from its holster, sighting along the barrel. The new clothing felt odd. unfamiliar, but guns were not unfamiliar. He had been one of the best marksmen in the Czar's Imperial Guards. Sandy King couldn't hit the broad side of a barn with a shotgun from twenty feet. Booze had wasted his nerves and often blurred his vision. Sure, in the old days, after the Yanks had won and he had wandered West, he could shoot as well as the next. The wild cowboy enthusiasm at the end of a cattle drive had provided his first introduction to heavy drinking. Later, as a rustler, Sandy King found some hard drinking buddies. And after he got too old to ride with comfort, light pilfering and downright begging had helped him maintain his habit. . . When Russian Bill arrived in Tombstone, he looked like New York's vision of the American Cowboy-a real tender foot. The rustlers from Charleston were the first to spot him, and they had their fun. Russian Bill, in his broken English. challenged a couple to .a shooting match. They got some empty bottles and cans and walked to the outskirts of town, where Russian Bill's shooting prowess won him new friends. He joined up with the rustlers and moved to Charleston. "No, you damned nuisance," grunted the cowboy as he strode into the saloon. Sandy King started to follow, then stopped. Lordsburg had not treated him well. In fact, people were just downright rude about his panhandling. There didn't seem to be any loose money around, and now two days of rain had overflowed the wash he had camped by. He decided he would move on as soon as he could get some bedding and grub. He walked away from the saloon, eyeing clotheslines and noting the doors to underground cellars. Russian Bill angrily kicked a rock from the dusty road as he walked through Charleston. His horse was lame, and he needed it. Folks told him Charley was going around saying he had outshot Russian Bill in a shooting match, and Bill wanted to find him so they could at least match skills. A man hailed him from the saloon door, speaking slow so Bill would understand. "Say Bill, I heard Charlie's over in Lordsburg." Bill thanked him with a wave, then returned to his room where he quickly packed some things. A few minutes later, he slipped out the back door, passed the outhouse, and hopped on the first horse he found. Sandy King's head was pretty clear that morning, since he had failed at begging whiskey money the day before. But he had used the night well-he had stolen enough food to last several days. Now he just had to wait until someone left a blanket out overnight. Russian Bill surveyed the dim road that faded into the desertscape. The road was complemented by telegraph poles strung with wire that hummed towards Lordsburg with a description of Russian Bill and the horse he had stolen. Sandy King knew something was in the air. More men than usual were gathering in the saloon. He went in and found grim looking men a little looser with their money than usual. As he slowly accumulated whiskey, he learned that they were waiting for a horsethief. He settled into a corner to watch as the men set up a vigilante court. He knew if he hung around, there would be a celebration after the trial. 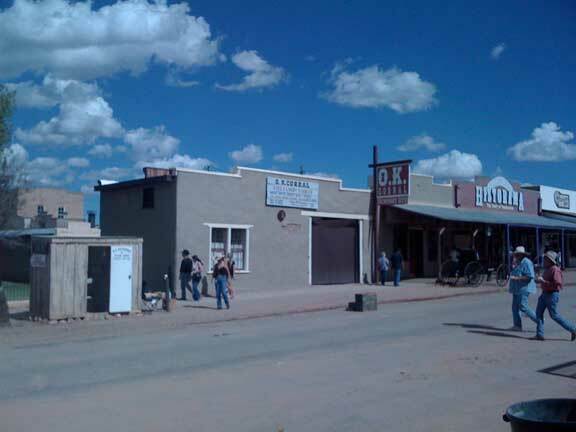 When Russian Bill walked into Lordsburg saloon, he found a shotgun staring at him. The holder waved him to an empty chair, and he walked to it and sat down, trying to find a smile on the faces of any of his captors. Sandy King watched as the makeshift court tried Russian Bill. It was obvious the man was having trouble understanding the proceedings. The jury went out and examined the horse, then showed Bill the telegraph. Russian Bill didn't seem to understand until a rope was thrown over a ceiling beam and a noose was quickly fashioned. It took four men to get his head through the noose. Instead of hearing a wild cowboy yell, he found the townfolk looking at him grimly. Sandy King was hung for being a damn nuisance. By Charles Casey, Tucson, 1984. Entertainment Magazine. © 1996-2016. EMOLorg. Tombstone Entertainment Magazine. All rights reserved. Republished from Entertainment Magazine, July 1984. Robert Zucker, publisher.